Description: In this book the author traces the history of dogs in Britain, the gradual development and differentiation of the breeds, and the introduction of new breeds from abroad. Small pet dogs, for instance, were brought over from the Continent in the 16th century and had firmly established their popularity by the 17th century. Before that time, dogs had been used mostly for sport and the chief breeds were mastiffs, greyhounds, lurchers and spaniels. 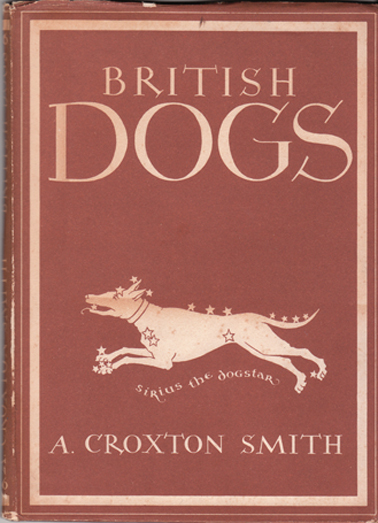 This authoritative work contains a list of all recognised breeds. Features 8 superb colour plates. Illustrated throughout with excellent b&w reproductions of oil paintings, woodcuts, watercolours, &c.
Pictorial matt boards repeat jacket design. Spine and corners lightly bumped. Jacket lightly foxed and scuffed along its extremities. Small closed tear on rear; otherwise complete. Slight discolouration to endpapers where they have made contact with the jacket flaps. Pages are in very good condition: bright, unmarked, and virtually devoid of foxing – what little there is being too insignificant to mention. Measures 22.5 cm × 16.5 cm (9″ × 6.6″). Large 8vo. 48 pp.